My boys do weird things sometimes. Things that make me laugh. Actually, I don't think I ever laughed as much before I became a mother. Kids have a way of lighting up your days. 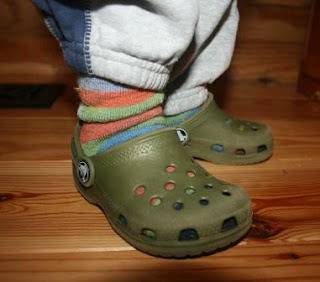 Nevermind that it was 30* and not exactly Croc weather. Reid has a way of contorting himself in the bouncy. 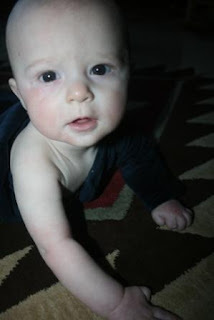 First, he gets the teething beads around his arm like an arm-lace. 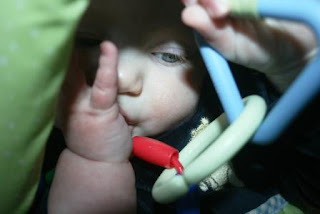 Then he sits up, leans forward, and snuggles the chain linkies, all while sucking his thumb. He does this - no lie - every time he sits in the bouncy. And Cort has become a stripper. Not sure how he does this. But no one is surprised. I am the oldest of 5, with 3 sisters and one brother. I am 9 years older than my brother. After just 14 months, parenting my son has been eye opening! So far, he has been destructive, curious, energetic, incredibly funny, and sooo messy. People tell me it doesn't change.